The problem with the increasing use of packaging in electronic goods, annoys every kind of customer. 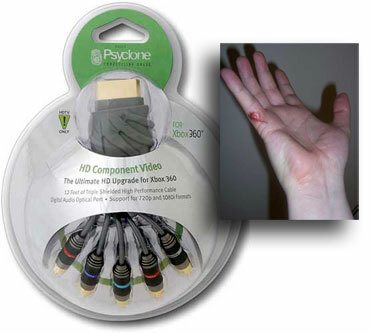 From Psyclone electronics cables encased in impenetrable layers of thick plastic to DigiPower camera batteries coated with packaging several times the size of the item itself, the hardest part of buying electronics these days is opening the products when you get them home. In many cases, it makes solving Halo 2 seem like a kindergarten project. In honor of this packaging nightmare, Consumer Reports has created the annual Oyster Awards, shaming the creators of the hardest-to-open packages. It's no wonder hospital emergency rooms report significant increases in deep lacerations from product packaging during the week after Christmas. Sure, product manufactures want to make it so that products are hard to shoplift, but this is getting ridiculous. Commenters, any packaging horror stories?